Well, that's all fine and dandy, but you want to know why we're here. We're here because you have questions about the sporting life, and what you can do to make your inner athlete the healthiest ever. We have some of the answers, but we're also hoping to use this space as a place to seek answers with you, our readers. We here because you have questions about the sporting life, and what you can do to make your inner athlete the healthiest ever. We have some of the answers, but we're also hoping to use this space as a place to seek answers with you, our readers. • We're made in the USA, right here in New Jersey. 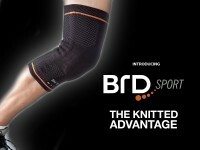 • Our knee, ankle, wrist and elbow supports are made with a unique, washable, 4-way knit technique that's more comfortable than any brace or support you've experienced before. We're committed to encouraging participation in sports, and everyone's inherent right to enjoy being active for as long as possible. • We're sponsors of one of the nation's great multisport teams, Columbia MultiSports Club, and in this space you'll find interviews with team members, and some training tips from them, as well as some information on how they use our equipment. You'll also find interviews with sport luminaries, and some key information on why we've chosen the materials and processes we've chosen to make our products. And our team has some races lined up for ourselves, so we're looking forward to sharing our trials and tribulations with you as well. So stay with us. We're looking forward to hearing from you, and we hope you'll look forward to hearing from us, every Wednesday, here at the BRDSport.com blog.